Do you ever have specific moments in your life that you want to cherish and never forget? Well, I was driving home one morning from dropping off my children at preschool and I turned around to check on the baby and he had his head turned towards me and was staring at me from his car seat. My other two used to do this as well and I always loved it. So, I decide to pull into a parking lot and take a picture so I could always remember that feeling of adoration and love towards this little life that was staring back at me. So, take some time today to really look and watch and remember those small but precious moments that may likely be gone in years to come. Do you have a favorite moment that you have cherished in your life? Please share! The moments that I love the most with my son are when we are laying next to each other and he will take his little tiny hand and rub my arm or my face. It helps put him to sleep, If I am not there he will pinch his little neck instead. Isn’t that adorable. I remember when my kiddos would do that too. Ahh Dawn, He’s so beautiful. Isn’t it nice to feel loved? I had a wonderful day with KG and was grateful to have had the time with her. That is absolutely ADORABLE! Yes, I LOVE Those moments as well! Sweet pic. 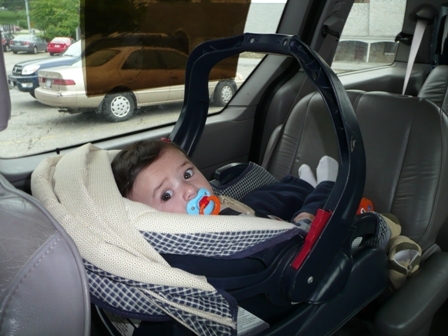 I remembered the 1st time I caught cranky pants able to look over the car seat and see me.